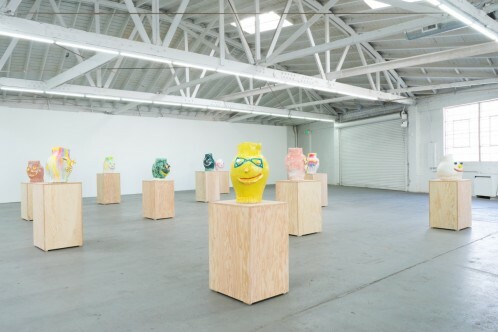 For his new solo show with Venus over Los Angeles, the multi media artist Dan McCarthy presents an evolution of his facial ceramics sculptures. After a few years experimenting with facial expressions and human representations, McCarthy´s new series comes along in bright in colors. The show is an investigation of the human condition and appearance. 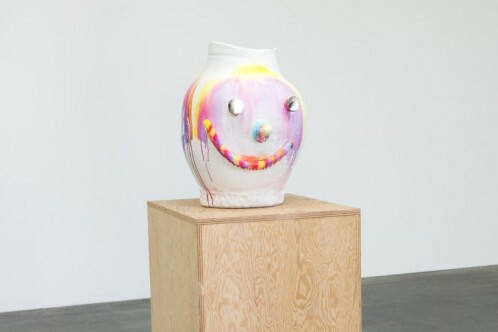 In a playful, intuitive and profund manner, McCarthy depicts the human face in a metaphoric and visual sense. With childish-like yet strong facial expressions, the clay figures display a wide arrange of human kind. All of them have a very personal and indicative name: Captain Catalina, Little Switzerland, See Weed or X-Ray Spex. They all appear as a reflection of human criteria, mimics and moods. Along with these sculptures, the surroundings and weather forecast of the artist habitat, California, is as well on view. Indeed, a series of painting tinted of thunder and clouds depicts the West Coast area. Each of the pieces is accompanied by a little sentence stating the emplacement of the work: Hawaii, Maui or Huntington Beach.